This BTO 'Build to Order' model Xserve Xeon 2.66 "Eight Core" Early 2009 (Nehalem) runs dual 2.66GHz Quad Core 45-nm Xeon X5550 Nehalem processors with 256k of level 2 cache per core plus 8MB of level 3 cache along with "Hyper-Threading" and "Turbo Boost" support allowing dynamic multi-thread/ multi-speed output based on processor loads. 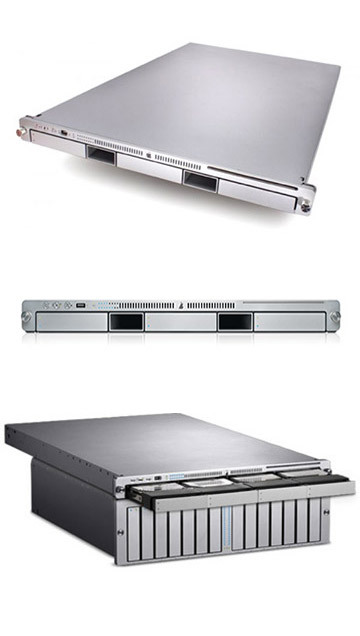 The base configuration has 3GB of DDR3-1066 ECC SDRAM installed as 3 DIMMs to compliment the triple channel memory bus design of these models, a 7200 RPM 160GB with 8MB cache in a hot-plug "Apple Drive Module", a 128MB internal SSD option was offered, an 8X dual-layer "SuperDrive" plus an NVIDIA GeForce GT 120 graphics processor running 256MB of VRAM. Ports and communication come via 1 Mini DisplayPort , 3 USB 2.0 ports, 2 Firewire 800 ports.